Preservation of damp walls have been undertaken by Kenwood to a beautiful Grade ll listed building. 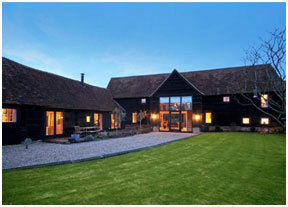 This property is a large detached barn in the Chiltern Hills area which boasts over 2 acres of land. The building was first converted in the 1960’s whilst still retaining the original beams given the barn real character. Tithe barns date back to the middle ages when they were used to house produce from local farms that were given to the church as a tax, they had to give a tenth (a tithe) of the crops. This well-appointed property required damp treatment within the bedrooms. The damp treatment included installation of a damp proofing system. Now with these works complete the building can continue to be a beautiful family home.